The history of Polish bigos, commonly known as “hunter's stew” in English, begins many centuries ago. Bigos is a traditional single pot dish, usually made during the winter months or for special occasions. Many Poles associate it with sauerkraut and the taste of meat. weigh and collect the crayfish, put it in a pot, select beef marrow, mix together, pour in the broth, add pepper, flowers, butter, weigh and serve. You can add some lemon or vinegar and serve together with vegetables. Wielądko has a recipe for bigos using a capon (castrated rooster). However, 17th century bigos wouldn't be at all appetising for Poles today. In 17th century cuisine, bigos was either made sour with vinegar, lemons, limes, or even with sorrel or gooseberries; made sweet with sugar and raisins; or spicy with pepper, cinnamon and other spices. Strong flavour was valued back then, today it would be simply inedible. 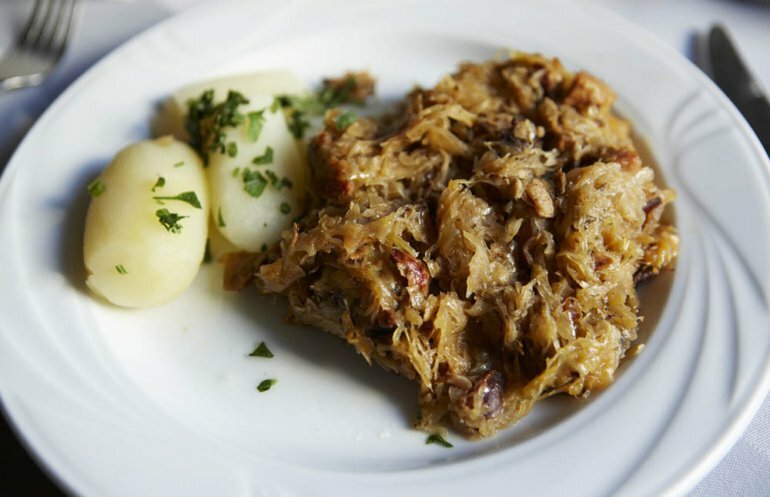 The bigos which Poles eat today has its roots in the 18th century. “Bigos with cabbage” and “rogue bigos” (a poorer version of the “real” bigos, called this to distinguish it from the dozens of others of variants) were the ancestors of the meal, which today is mainly cabbage, with meat as just an extra. Due to the difficulty involved in getting exotic fruit, sauerkraut (pickled cabbage) was used instead of more expensive lemons and limes for a sour taste. In manor houses, bigos was made with the leftovers of meat from great celebrations. Bigos was taken on journeys and for hunting, hence the name “hunter’s bigos”. While hunting, bigos was served with a “cheer”. The pre-prepared bigos was heated on a dish with a sealed lid. When enough pressure had built up, the lid would erupt with a loud “cheer” and signify that the bigos was ready for consumption. Every respectable nobleman would take a pot of bigos with him while hunting or on a journey. Marja Ochorowicz–Monatowa’s Universal Cookbook contains a recipe for “hunter’s bigos” where she says: “We read about the famous bigos that all of the Polish nobility would journey with in old tales. Even today it is the basis for breakfast on every hunt, hence the name “hunter’s bigos”. This kind of bigos contains many different kinds of meat: roast beef, lamb, roast pork, game, poultry, ham, sausage – the more varieties of meat, the better the flavour.” Sauerkraut, mushrooms and Madeira are also added. Bigos as a type of ragout from game, with different types of meat, sauerkraut and sour apples was mentioned by the French gastronome of Polish origin Henryk Babiński (alias “Ali–Bab”) in Gastronomie Pratique, published in France in 1907. Maria Śleżańska’s The Polish Chef has a recipe for bigos using the leftovers of a roast with apples or pickles and vinegar, but this time without sauerkraut. For our first party in our apartment on Montmartre in Paris in 1932, I decided to serve bigos. Arthur’s sophisticated friends liked it so much that it soon became my plat de résistance. Nela’s bigos was a favourite among family members in New York as well. In her cookbook Nela’s Cuisine, the wife of the world famous Polish-Jewish pianist Artur Rubinstein describes several anecdotes about preparing bigos in unusual places, for example preparing bigos for 45 people in a tiny stove in a hotel kitchen alcove. In the pots warmed the bigos; mere words cannot tell Of its wondrous taste, colour and marvellous smell. One can hear the words buzz, and the rhymes ebb and flow, But its content no city digestion can know. To appreciate the Lithuanian folksong and folk food, You need health, live on land, and be back from the wood. Without these, still a dish of no mediocre worth Is bigos, made from legumes, best grown in the earth; Pickled cabbage comes foremost, and properly chopped, Which itself, is the saying, will in ones mouth hop; In the boiler enclosed, with its moist bosom shields Choicest morsels of meat raised on greenest of fields; Then it simmers, till fire has extracted each drop Of live juice, and the liquid boils over the top, And the heady aroma wafts gently afar. Bigos is also described by Wacław Potocki’s in Italian Banquet, Jędrzej Kitowicz in Description of Customs, Jan Nepomucen Kamieński, Tadeusz Boy-Żeleński, Wincenty Pol and Juliusz Słowacki. Bigos was also the favourite dish of Bolesław Leśmian, Czesław Miłosz and Leopold Tyrmand. In modern cookbooks, we can find recipes for many different varieties of bigos. They are often named according to their history. For example, “Lithuanian Bigos” with apples, “hultajski” with bacon and meat and “hunter’s bigos” with game. Using the basic ingredients in varying proportions, in particular meat, sausage, and sauerkraut, bigos differs only in added ingredients such as mushrooms, plums, jam, wine or spices. Lovers of bigos insist that it must all be cooked “low and slow” i.e. on a small flame for a long time, ideally for a few days. It is also best to freeze the bigos to improve its taste and achieve that spicy-sour taste with hints of smoked meat.